I haven’t taught any of my children to ride a bike. Not one of the four. I’ve helped, for sure. I’ve held on to the seat and steadied them while they will their bodies to balance and their feet to push the pedals, but my husband has always been the one to let go of the seat and enable their independence. This never even occurred to me until I was working with my youngest on riding sans training wheels last month. My husband had been gone for the weekend and sensing my little guy was ready, I took the training wheels off and started coaching him along. When my husband arrived home he put one steady hand on the back of my son’s bicycle seat, lingered for a mere second, and sent him on his way. Just like that, he was riding a bike. And I realized, it was the letting go that was hard for me. 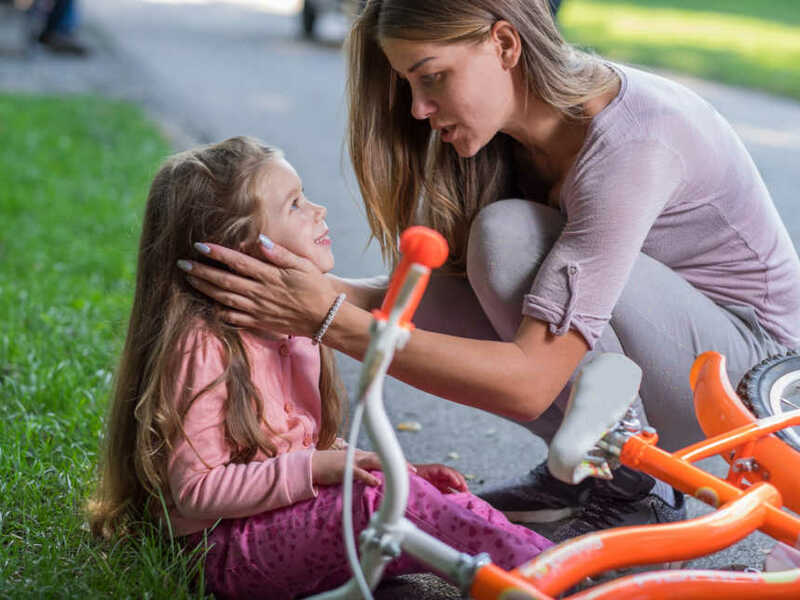 If my husband hadn’t come home, I might still be scampering along behind that little boy’s bike – holding him back, rather than watching him soar. One of the most popular posts on my blog is one I wrote last fall about the importance of teaching our kids to do hard things. Recently a reader responded to that post by saying I really want to do this, but how? Excellent question! And one Mrs. Can’t-let-go-of-the-bicycle-seat hasn’t stopped thinking about. Life is full of hard things. Full of them. Learning to walk is tough. Growing up is challenging. Learning to become a good spouse is no easy feat, settling into the role of mother is hard. Hard. Hard. Hard. So why wouldn’t we want to prepare our kids to handle hard things well – to not balk at the pressure? Why shouldn’t we seek to give them eyes that see beyond what’s right in front of them, intentionally training them and equipping them with the tools to handle hard things? I’m thankful to the Brave reader who asked that question, because it’s worth thinking about as a parent. Here are 5 things I want to be intentional about in raising kids who can do hard things, kids who are overcomers. Really. Our home is a training ground for life. And so is yours. 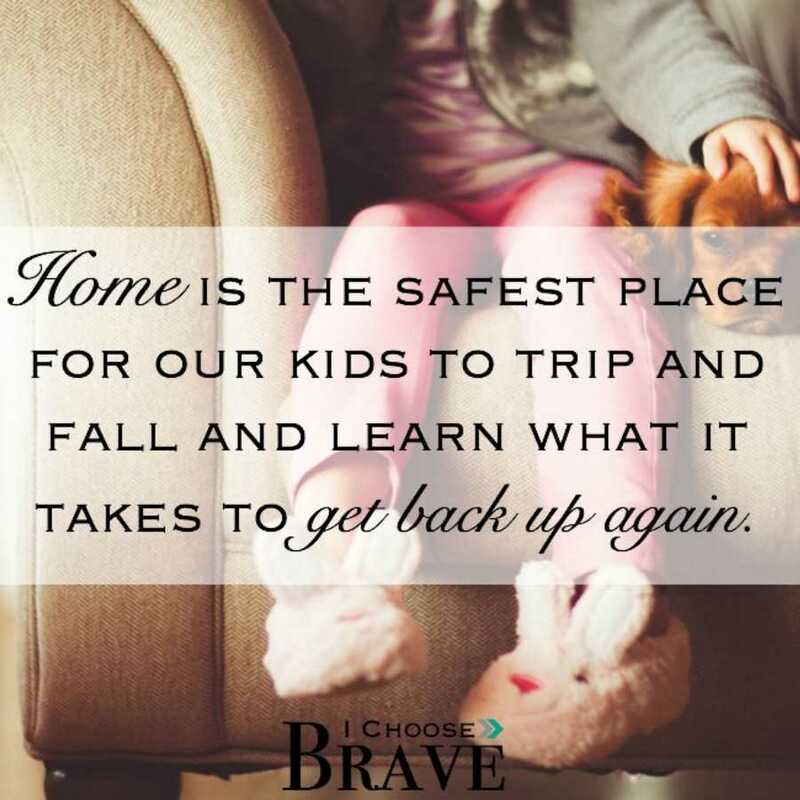 It’s a place where our children are loved no matter what, a place where their worth is not based on performance, and the safest place for them to trip and fall and learn about what it takes to get back up again. As the supplier of band-aids and ice packs this can be hard for a mama to do. My natural tendency is to smooth out all the rough spots, champion my children to success and just continue holding on to their bicycle seats for a good long while. But this does not help them in the long run. A cut-throat work place or college class are not the best place for our kids to be learning these lessons for the first time. Be intentional about giving your children a safe place to mess it all up, to crash and burn, to learn consequences and forgiveness and exactly what it takes to get back up and try again. Watching our children deal with give us the opportunity to teach them how to respond well. Recently my daughter took two weeks of group swimming lessons – something that was new to her. Although she was scared, she made it through the first week quite well. She conquered some fears and by the end of the week she was having all kinds of fun. However, after a long weekend she began to fear swimming lessons again and didn’t want to return for the second week. Through tears she told me how much she hated swimming. And I quickly understood this wasn’t really about swimming anymore. She was being seized by fear. She loved swimming just a few days earlier and now she was believing a lie, believing her fears. One thing I’m learning is that no matter how irrational, improbable, or ridiculous it may seem to someone else, fear is real. We all fear different things, but when you are in the midst of it, it becomes your reality. Minimizing someone else’s fear is not helpful. I remember having a math teacher once who seemed to think all of math was easy. Which was great for him, but it did not change the fact that it was NOT easy for me. Ever. I fought for every good math grade I got. It never got easy, but I was able to learn the principals well enough to get through it and avoid it for the rest of my adult life. I’m kidding…partly. The same strategy applied to my scared swimmer. Telling her swimming is fun and not scary would not be helpful, but teaching her how we handle fear, how we fight lies that can eat away at our hearts, is quite useful. Have your kids recite scripture, write the Word, and pray about it together. Childhood fears can be exhausting and frustrating as a parent, but these are the moments when the Word of God can become living and active for our children, when they get to learn how to apply it to their everyday lives. What an awesome opportunity we have! Just yesterday that scared swimmer (who is now loving swimming again) was working through her new Faith Journal) and came to show me what she listed as the number one thing she loves about God. In her 8 year old handwriting she carefully wrote “He makes me brave.” Lesson learned. And you can bet this mama got a little teary. While we try to re-shape hearts and complaining attitudes around here we don’t shy away from calling things hard. Learning to swim is hard. Pulling weeds is hard. Keeping a tidy home is hard. Sure it is, but that doesn’t mean we don’t do it. As my kids get older we talk more and more about the hard things of life, because they don’t ever magically go away. 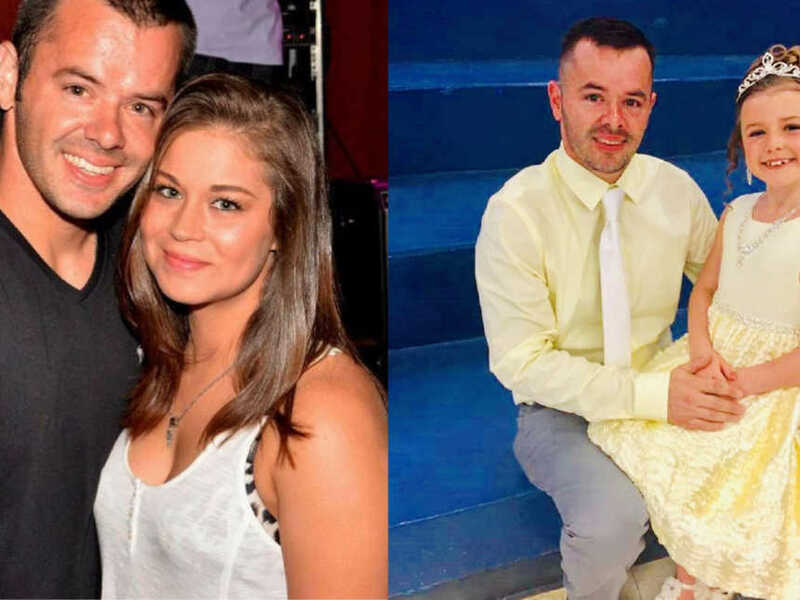 We talk about their dad’s job and the hard things he does there. We talk about paying bills and taxes, we talk about being treated unfairly or unkindly. Opportunities abound – that grumpy grocery store clerk who seems to be having a hard day, discuss it with your kids. That construction worker who is sweating up a storm in his hard hat, talk about it with your kids. Talking truth with your children, rather than sugar-coating life lessons, conditions them to understanding that hard work is a part of life and not something we shy away from. Have you ever considered intentionally training your children to do hard things, to push past their will and what they see right in front of them in order to learn the value of perseverance? You can be intentional about helping your children develop faithfulness and tenacity. Try taking on a big challenge as a family. Help your kids engage in conversations outside of their comfort zone or offer an apology even when it feels awkward. Show them how to serve others or what it might look like to give sacrificially. These things don’t come naturally for most children, or adults for that matter. Walk them through it intentionally and give them opportunities and new environments in which to practice it. Make sure they see you doing the same. You can practice hard things at home as well. If your home is like ours there are plenty of jobs and chores my husband and I do out of habit or because it’s quicker and cleaner if we do them ourselves, but allowing our children to do the work grows and shapes them. Let them fold their clothes, let them weed the flower beds, teach them to clean up the kitchen, to sweep the steps and wash the windows. The tasks will grow with age, of course, and you can even make some of the bigger and more challenging chores paid jobs, but only pay for a job well done. It all takes effort and oversight on your part, but slowly they will begin to learn the value of hard work and doing hard things. And, hopefully, your house well be getting cleaner in the process! Similar to discipline, follow through is key and is often the hardest part as a parent. Recently, my husband was working on training my son in the area of responsibility and before leaving for work one morning he said to me, “We had a talk last night about responsibility and I told Tyler that I expect his chores to be completed by the time I get home from work. Please don’t give him any reminders today.” No reminders. Can I tell you how that about killed me as mama? 9:00: Chores weren’t done. 11:00: Chores weren’t don’t. And I may have developed a nervous tick trying to keep my mouth shut. Thankfully, by the time my husband got home the chores were finally done and I can honestly say I did not give any reminders. But it doesn’t always work out that way. This parenting gig, this training kids thing, is hard. It’s work. You love those kids like crazy and if you’re anything like me, you tend to let them off the hook too easy at times. But that is not parenting brave. Parenting brave requires the very same thing of us that we are trying to train in our kids, making decisions not based solely on what is right in front of us, but with the end result in mind. In this case that would be responsible and capable adults. And one last tip: PRAY. Without ceasing, pray for your children and for your role in raising them. (Want to join the I Choose Brave community as we Pray for our People? ) Pray that you will seize the opportunities, big and small, to teach them well, to let them know who they are- their true identity, and to help them see Truth. Pray that you can serve as a worthy example and that if (when?) you mess it all up they will understand the grace and forgiveness of Christ that makes all of the difference in parenting, in childhood, in life. Keep parenting brave, friends. There is no better way to do it. This story was originally written by Katie of I Choose Brave. You can follow I Choose Brave on Facebook here. The article originally appeared here. Do you know parents who could benefit from this story? SHARE on Facebook to make them aware help is available.